We are happily to finally make public our report exposing the impact of the bedroom tax on residents of Leeds. 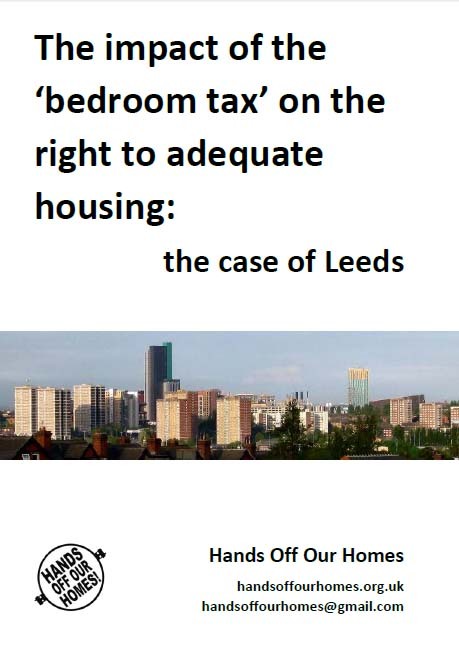 We have drawn on evidence from 60 case studies of affected tenants and Leeds City Council statistics (acquired through Freedom of Information requests) to provide a detailed and compulsive picture of the impact on the bedroom tax on the ground. The report shows how the bedroom tax infringes the right to adequate housing in multiple ways. Particular concerns of the report are how to bedroom tax constitutes an unaffordable rent increase, targets disabled people and infringes the rights of the child and the right to family life. We also found many incidences of bullying and harassment by landlords and landlords agents (including Leeds City Council) that is causing distress for affected tenants and evidence that a huge number of tenants are not being informed about their eligibility to Discretionary Housing Payments. The report has been sent to the Raquel Rolnik, UN Special Rapporteur on adequate housing in response to her request for evidence of the impact of the bedroom tax however should be of interest to anyone concerned about the bedroom tax. Please read and pass on to anyone who would be interested.